Take weapons in hand and go hunting for zombies on this map. Here you will be in role of a military along with other soldiers. Your common task is to destroy the zombies approaching you very quickly. Zombies are very dangerous especially for soldiers since a few bites can turn a fighter into an infected one and then he will become another zombie. Take the weapon and go to the first place where you learn to shoot properly and get comfortable. Zombies are always attacked and only bullets can stop them, so do not stop shooting and defend your squad otherwise you will all turn into dead. 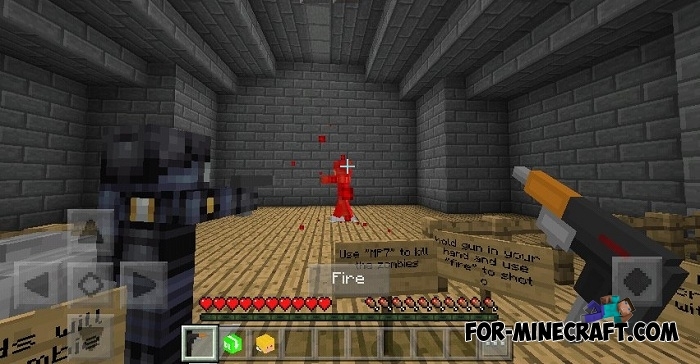 Mob Squad Textures Minecraft PE (all versions)This texture-pack will turn the most frequently encountered mobs into something bright and unforgettable..